I made this during a Thai-themed Meatwave I hosted over the summer, which meant I had most of the ingredients on hand already, another reason this recipe from J. Kenji López-Alt stood out to me. 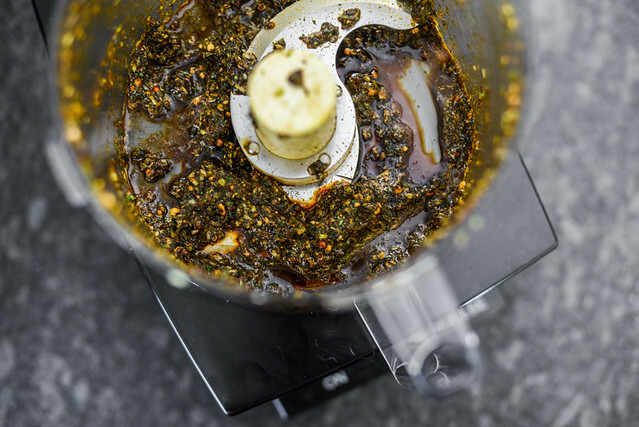 The marinade consisted of lemongrass, garlic, cilantro, palm sugar, black pepper, coriander, fish sauce, and dark soy sauce. I pulsed all of these together in a food processor until a thick paste formed. 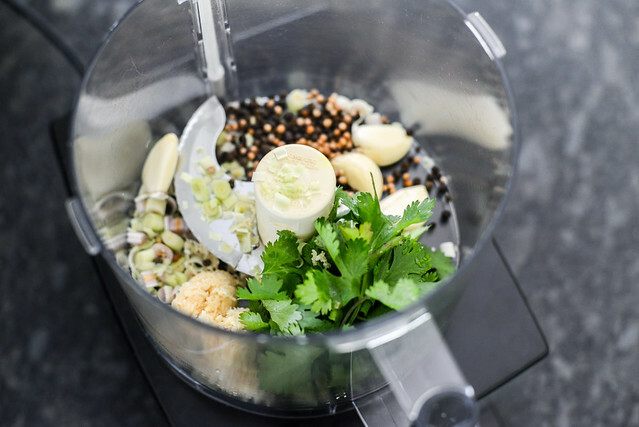 I wanted to keep the ingredients coarsely chopped to mimic the result I may have gotten if using the more traditional mortar and pestle. 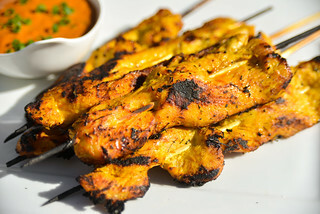 One more feature of this recipe that attracted me was the requirement to skewer the chicken halves lengthwise through the leg and breast, a distinct procedure I had yet to try. 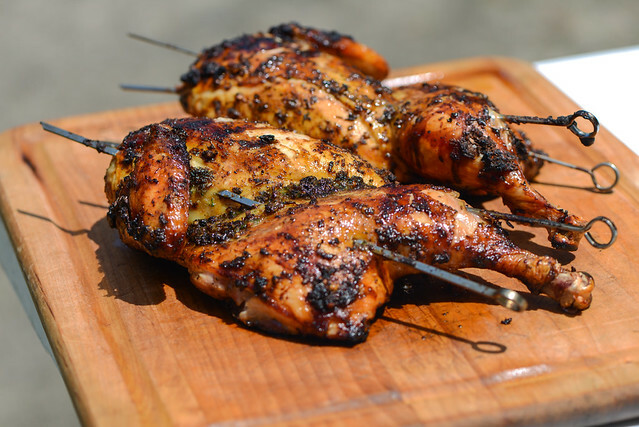 This is to make for a more stable, and easier to handle chicken on the grill. Now I haven't had much problems flipping chicken halves in the past, but it does require getting the tongs securely under the thigh and breast simultaneously for success, so the skewers just eliminates that margin for error, plus make for cooler presentation overall in my opinion. Once skewered, I placed the chicken halves in a large container and used my hands to rub on the marinade all over. I then covered them, placed in the fridge, and let the chicken marinate overnight, but just a couple hours will do if you're short on time. I wavered on whether to make the sauce that accompanied the original recipe since I already had a couple Thai sauces on hand that I thought would serve this chicken well. But again, it required no new ingredients for me and only a few minutes of work, so I decided to whip up a batch. This simple dipping sauce was composed of palm sugar, fish sauce, vinegar, Thai chilies, lime juice, and garlic to make a sweet, spicy, and super savory concoction. 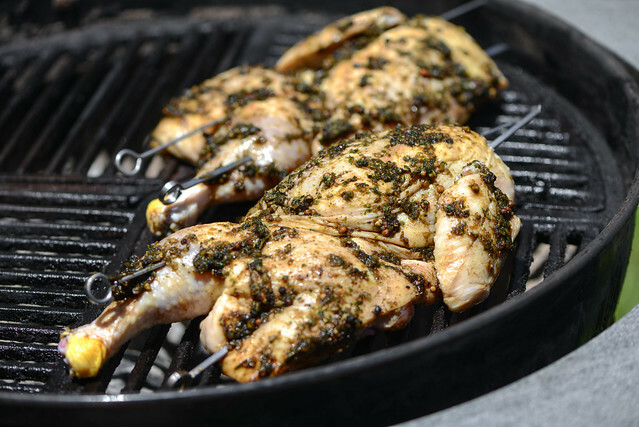 The key to perfectly chicken on the grill is really about method and vigilance. 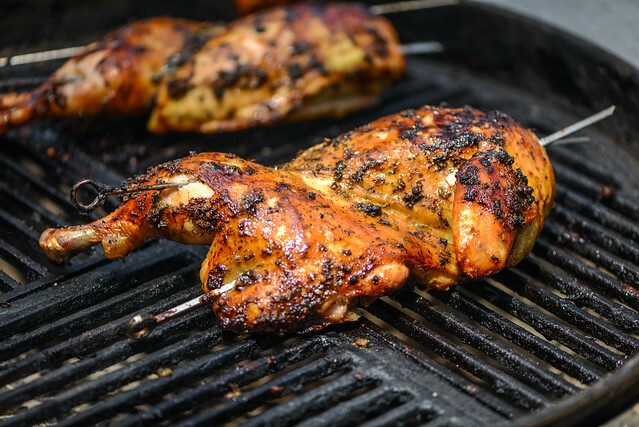 First, to avoid the oft common uneven cooking, which in turn leads to overcooking, I employ the two-zone method, where all the coals are on one side of the charcoal grate and the chicken is placed on the cool side of the grill, covered, and roasted. This indirect heat is more even and less intense, leading to overall better cooking. Positioning the chicken with the legs and thighs facing the fires also helps since those pieces are less prone to drying out than the breasts. As this chicken roasted, I brushed on some of the marinade that remained in the container to further intensify the flavor and develop better color. After roasting for 15-20 minutes, the vigilant part came in—I began measuring the internal temperature of the breast consistently, waiting for it to reach 145°F. This was 5-10°F shy of my final desired internal temp, which the chicken picked up after I flipped the halves over and moved them to direct heat in order to crisp the skin. It only took a few minutes for the skin to get a little crispness and charring, at which point I double checked I was above 150°F in the breasts. I took a quick snap of the finished chicken on the grill before transferring it to a cutting board, and boy did it look pretty with its golden brown color, bits of charred marinade, and the attractive skewers running through it. After a five minute rest, all that was left to do was remove the skewers and cut each half into individual pieces and serve. In an attempt to find a flavor packed chicken recipe, this certainly delivered. The skin had an overall salty and savory quality with intense pockets of garlicky, lemony, and peppery bits that went a long way to adding depth to the juicy meat. Still, in an overly meaty bite, I could imagine being underwhelmed, but this is where that dipping sauce did its magic by amping up the flavor ten fold. 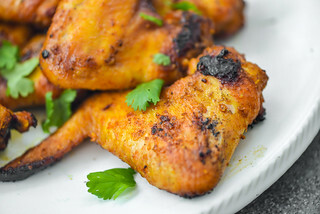 As I look back at this and other chicken recipes I've done recently, I don't see one that didn't end in something incredibly tasty, making me think I should stop shunning grilled chicken as much as I do now and instead embrace everything that is great about it, this recipe being perfect proof of that. 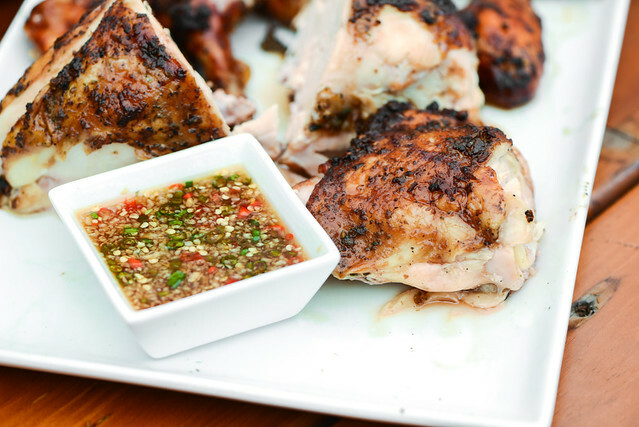 A savory marinade gives this juicy chicken a ton of flavor that's amplified more with a sweet and spicy dipping sauce. 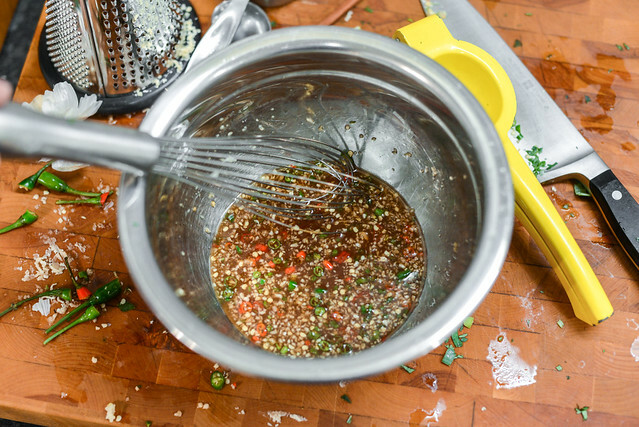 To make the dipping sauce: Whisk together sugar, fish sauce, vinegar, chilies, lime juice, and garlic in a small bowl until sugar has dissolved. Transfer sauce to an airtight container and store in refrigerator until ready to serve. 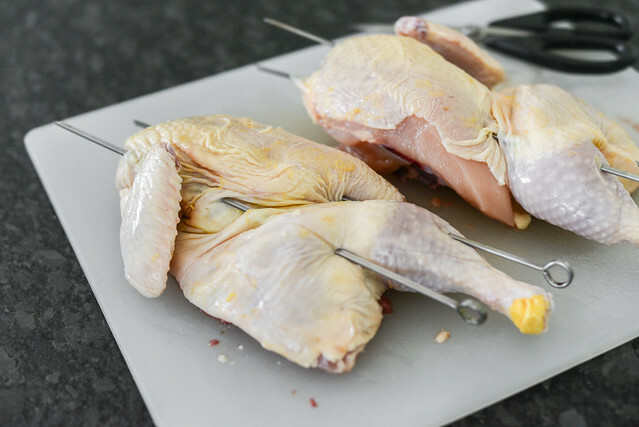 Place chicken halves, skin side up, on a cutting board and run two skewers parallel to each other through the legs and the breasts of each piece. 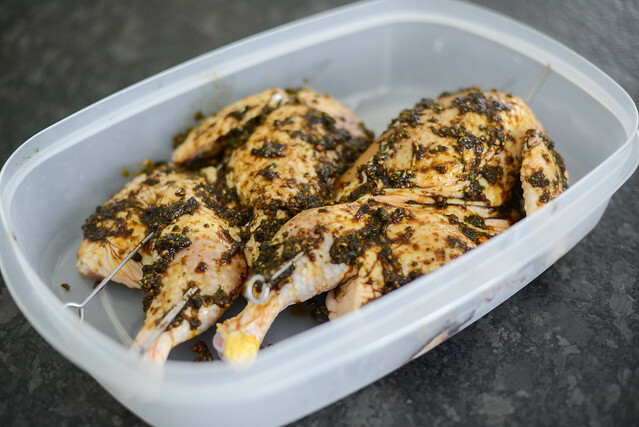 Transfer chicken to a container and spoon on marinade. 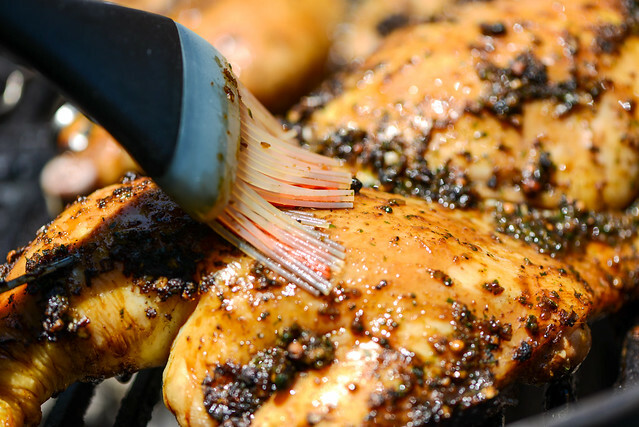 Using hands, rub marinade over all surfaces of the chicken. Cover container and transfer to refrigerator. Allow chicken to marinate 2 hours to overnight. Light one chimney full of charcoal. When all the charcoal is lit and covered with gray ash, pour out and arrange the coals on one side of the charcoal grate. Set cooking grate in place, cover grill and allow to preheat for 5 minutes. Clean and oil the grilling grate. 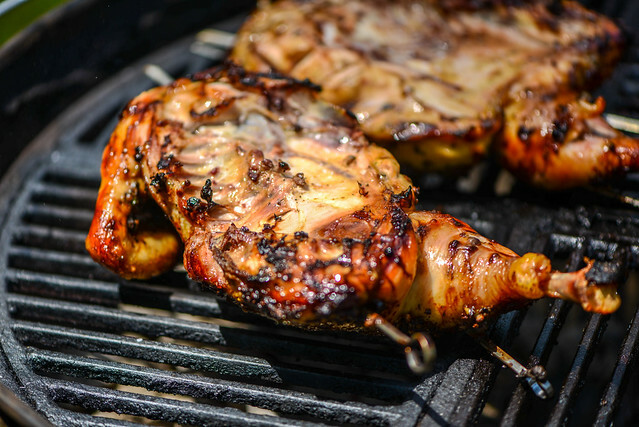 Place chicken halves on cool side of grill, cover, and cook, brushing chicken occasionally with excess marinade, until an instant read thermometer reads 145°F when inserted into the thickest part of the breast, about 45 minutes. Flip chicken over and move to hot side of the grill. Cook until skin crisps and lightly chars, but does not burn. Flip chicken over and move too cool side of grill. 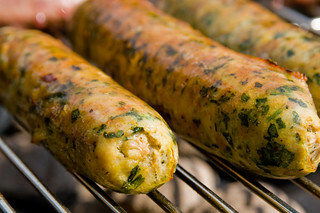 Insert an instant read thermometer into thickest part of brest and if temperature reads less than 150°F cover grill and continue to cook until chicken reaches temperature. Once at 150°F, transfer chicken to a cutting board and let rest for 5 minutes. Cut chicken into individual pieces and serve immediately with dipping sauce.